Allergic rhinitis (AR) poses a global health problem and can be challenging to treat. Many of the current symptomatic treatments for AR have been available for decades, yet there has been little improvement in patient quality of life or symptom burden over the years. In this review, we ask why this might be and explore the pathophysiological gaps that exist within the various AR treatment classes. We focus on the benefits and drawbacks of different treatment options and delivery routes for AR treatments and consider how, given what is known about AR pathophysiology and symptomatology, patients may be offered more effective treatment options for rapid, effective, and sustained AR control. In particular, we consider how a new AR preparation, MP-AzeFlu (Dymista®, Meda, Sweden), comprising a formulation of an intranasal antihistamine (azelastine hydrochloride), an intranasal corticosteroid (fluticasone propionate), and excipients delivered in a single spray, may offer benefits over and above single and multiple AR therapy options. We review the evidence in support of this treatment across the spectrum of AR disease. 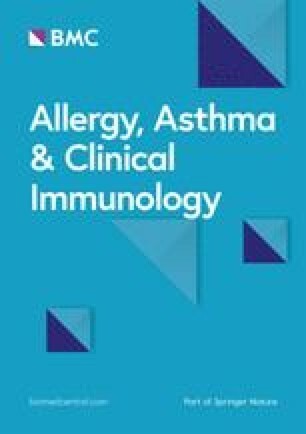 The concept of AR control is also reviewed within the context of new European Union and Contre les Maladies Chroniques pour un VIeillissement Actif-Allergic Rhinitis and its Impact on Asthma initiatives. Allergic rhinitis (AR) is a recognised global health problem. It is the most prevalent chronic allergic disease affecting European citizens today, with a prevalence in Sweden of 25% . Although often perceived as a nuisance condition, the reality is AR exacts a high toll on patients’ lives due to considerable symptomatic burden when untreated or undertreated, negatively impacting patients’ quality of life (QoL) [2, 3, 4, 5, 6, 7]. AR is felt in all areas of daily living, including performance at work and school [8, 9], and can be associated with poor sleep quality , cognitive and mood impairment , and even the ability to drive . The burden of AR is also felt socioeconomically, and this, too, is often underestimated and underappreciated [4, 5]. A recent Swedish survey revealed mean annual direct and indirect AR-related costs per individual per year of €210.30 and €750.80, respectively . This amounted to a total annual cost to the economy of €1.3 billion, with presenteeism representing 70% of the total cost . In fact, others have shown that AR has the greatest negative impact on work productivity of any chronic disease, exceeding that of heart disease and diabetes combined . The importance of AR control has now been prioritised at the European Union (EU) level . AR can be challenging to treat. Most patients presenting to their physician have moderate/severe disease [6, 16, 17], and many experience persistent symptoms  and are polysensitised [8, 19]. Difficult to treat phenotypes have emerged, including mixed rhinitis [both AR and non-AR (NAR)] , severe chronic upper airway disease (i.e. uncontrolled disease despite guideline-directed care) [21, 22], and local AR (i.e. localised nasal allergic response in the absence of systemic atopy) [23, 24, 25]. More effective pharmacological treatments are needed to meet these challenges. There are currently many AR treatments available, with antihistamines, leukotriene receptor antagonists (LTRAs), oral steroids, and intranasal corticosteroids (INSs) recommended in a step-wise approach according to AR phenotype and severity [5, 26]. INSs are still considered the most effective pharmacological AR treatment option; newer ones with lower systemic bioavailability have been introduced, but with no differences between them in therapeutic effect [27, 28]. These symptomatic AR treatments have been available for decades, but despite this, there has been no substantial improvement in patients’ QoL or symptom burden [29, 30]. One of the most recent additions to the AR armamentarium is MP-AzeFlu (Dymista®, Meda, Sweden), a novel formulation of an intranasal antihistamine [INAH; azelastine hydrochloride (AZE)] and an INS [fluticasone propionate (FP)] in a single spray . It is recommended as a first-line treatment option for AR patients with a visual analogue scale (VAS) score < 5 cm and as a preferred treatment for those with a VAS score > 5 cm according to the updated allergic rhinitis and its impact on asthma (ARIA) treatment guideline, the AR clinical decision support system (CDSS; use of a simple VAS to assess AR control is discussed later in this text) . Recently published Spanish guidelines also position MP-AzeFlu as a first-line treatment for moderate-severe AR, in preference to an INS for moderate-severe persistent AR , and the 2016 update to the ARIA guidelines recommends this combination for seasonal AR (SAR) . In terms of current AR management, there are two major gaps. The first is the “pathophysiological gap”. AR patients continue to experience symptoms despite single- and multiple-therapy AR treatment regimens [17, 34]. The second is the “control gap”, defined as lack of a common AR control concept and language. The aim of this review is to evaluate these gaps and show how recent pharmacological and control-assessment advances help to narrow them. The pathophysiology of AR is complex, comprising an early- and late-phase allergic response [35, 36]. The process is triggered by exposure to allergens such as pollen, mites, and/or animal dander that are recognised by antigen-specific immunoglobulin E (IgE) receptors on mast cells and basophils in presensitised individuals. The early-phase reaction is characterised by mast cell degranulation (Fig. 1). This phase is associated with the rapid onset (over a period of minutes) of acute nasal symptoms (i.e. sneezing and rhinorrhoea) and the emergence of ocular symptoms (i.e. itching, redness, and watering). These symptoms are caused by histamine release, particularly from mast cells in the nasal mucosa. This early-phase histamine release, together with the effects of other potent pro-inflammatory cytokines (e.g. leukotrienes) and eicosanoids (e.g. prostaglandins and kinins) also increases vascular permeability, leading to oedema formation. The late-phase reaction develops over a period of hours after exposure to an allergen. It is characterised by cellular recruitment of basophils, neutrophils, T-lymphocytes, monocytes, and eosinophils, and by the release of multiple mediators, including cytokines, prostaglandins, and leukotrienes, which perpetuate the inflammatory response [35, 36]. This late-phase inflammatory reaction is associated with tissue remodelling, further tissue oedema, and the development and perpetuation of nasal congestion, considered by patients to be one of the most troublesome symptoms of AR [37, 38]. As a result of mucosal inflammation, tissues become primed and react more vigorously to allergen exposure. These late-phase reactions and modifications in tissue responsiveness contribute to bronchial hyper-responsiveness (Fig. 1). Nasal and ocular AR symptoms, associated with both early and late response, can have an adverse impact on patients’ QoL and daily functioning [39, 40, 41]. When allergy symptoms are at their worst, on a near-daily basis, patients with AR may feel tired, miserable, and irritable at least some of the time . The duration and severity of ocular symptoms such as itchy and watery eyes, eyelid oedema, and asthenia have a particularly high impact on QoL, even greater than that of nasal obstruction and pruritus . A survey conducted in the United States, Latin America, and the Asia-Pacific region revealed that 35–50% of adult AR patients reported nasal symptoms had at least a moderate effect on their daily lives . Another survey in the United States found that patients with AR were twice as likely to report limitations on daytime physical indoor and outdoor activities than those without nasal allergies . The negative impact on daily activities for patients with AR can be greater than that for patients with type 2 diabetes and hypertension . Nasal congestion is the hallmark of the allergic response. This symptom is associated with sleep-disordered breathing, a condition that can have a profound effect on productivity and increased daytime sleepiness . More than 80% of AR and NAR patients report impaired sleep quality linked with nasal obstruction . Approximately one in four adult patients report they are unable to sleep or are awakened during the night because of their symptoms , whereas up to 45% of children experience sleep disruption because of nasal allergy symptoms . Furthermore, many of the key pathophysiological mediators of AR responses (i.e. 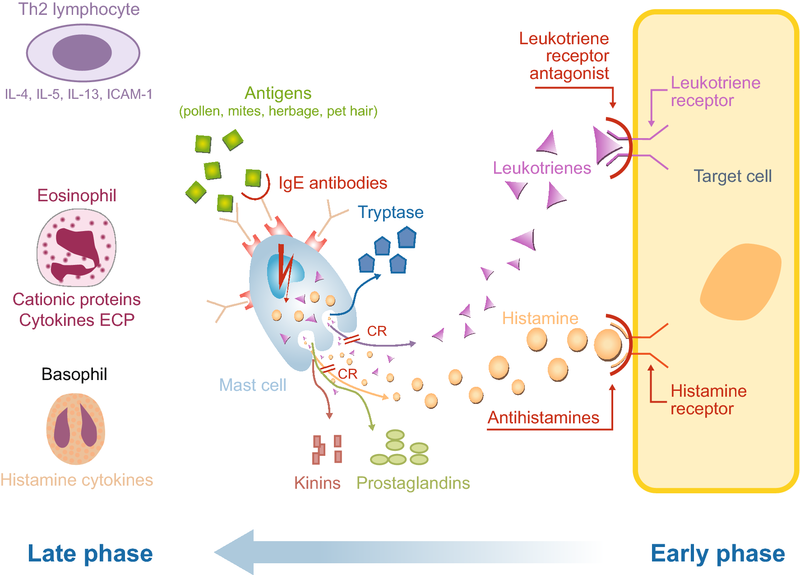 histamine, leukotrienes, cytokines, and prostaglandins) play a role in sleep regulation and might be directly involved in this feature of the condition, independent of nasal obstruction . Pharmacotherapies interact with the AR pathophysiological pathway at different points, reflecting their different modes of action (Fig. 1). LTRAs (e.g. montelukast, zafirlukast, and pranlukast) block the activity or secretion of cysteinyl leukotrienes (CysLTs), a potent inflammatory mediator associated with nasal congestion, mucus production, and inflammatory cell recruitment that typifies AR . They also have other anti-inflammatory activities, including inhibition of 5-lipoxygenase [49, 50, 51], histone acetyltransferase , adenosine 3′,5′-cyclic monophosphate phosphodiesterase , eosinophil migration, adhesion to vascular endothelium , and nuclear factor kappa-light-chain-enhancer of activated B cell-activation [54, 55]. Additionally, LTRAs can inhibit reactive oxygen species generation, as well as the release of protease and elastase from isolated human neutrophils [50, 56]. However, whether these non-CysLT-mediated effects are physiologically relevant in AR or achievable at clinical drug concentrations remains to be determined. At concentrations achievable in vivo, oral antihistamines (OAHs; e.g. loratadine, desloratadine, cetirizine, and levocetirizine) competitively inhibit the interaction of histamine with H1 receptors. At high micromolar concentrations, OAHs may also inhibit histamine-stimulated cytokine release and antagonise or inhibit other mediators of early- and late-phase allergic reactions to various degrees [57, 58, 59, 60, 61, 62]. Whether such high concentrations are achievable in the nasal mucosa following oral administration of these drugs is unlikely [63, 64]; however, it is likely that the desired concentrations to affect these additional anti-allergic actions are achievable with an INAH . Intranasal application of antihistamines (e.g. AZE, olopatadine, and levocabastine) ensures delivery of active drug directly to the nasal mucosa, thus enhancing its local anti-allergic and anti-inflammatory effects, while minimising systemic exposure to therapy . Many studies have shown the efficacy, safety, and tolerability of INAHs for the treatment of AR ; however, the majority of them relate only to AZE. AZE has multimodal action in AR, displaying not only H1-antagonist activity but also mast cell-stabilising, anti-leukotriene, and anti-inflammatory effects . Its antagonism at the H1 receptor effectively neutralises histamine-induced increases in vascular permeability and capillary fluid leakage responsible for rhinorrhoea, nasal pruritus, and sneezing [66, 67]. Mast cell stabilisation occurs as a consequence of AZE, blocking the IgE-regulated calcium channels on mast cells that are involved in mast cell degranulation, thus preventing histamine and other mast cell mediator release (e.g. tryptase, prostaglandins, kinins, and interleukins) [68, 69]. Anti-leukotriene effects occur due to prevention of leukotriene release from mast cell degranulation, reduction of leukotriene (LT)B4 and LTC4 production, and inhibition of phospholipase A2 and LTC4 synthase . AZE’s anti-inflammatory properties stem from a reduction in the number of inflammatory cells and mediators. These include eosinophils and neutrophils and mediators such as tumour necrosis factor (TNF)α , granulocyte macrophage colony-stimulating factor (GM-CSF), cytokines (e.g. interleukin [IL]-1β, IL-4, and IL-8) [72, 73], and adhesion molecules (e.g. intercellular adhesion molecule-1 [ICAM-1]) , all of which perpetuate the inflammatory response and induce symptoms of the late-phase response (i.e. congestion, rhinorrhoea, and hypersensitivity) . Research into the comprehensive pharmacological profile of AZE continues, with a recent study showing that AZE interferes with a specific immune interaction between T cells and dendritic cells in vitro . INSs are potent inhibitors of the late-phase allergic reaction in AR. They inhibit recruitment of Langerhans cells, macrophages, mast cells, T cells, and eosinophils into the nasal mucosa [76, 77, 78, 79]. This is most likely due to reduction of ICAM-1 expression on nasal epithelial cells, both during the early and late phases after allergen challenge . INSs may also prevent or reduce airway remodelling via downregulation of nasal fibroblast functions . INSs potently inhibit inflammatory mediator release from many cells involved in the pathophysiology of AR. For example, they have been shown to reduce concentrations of IL-4, IL-5, and IL-13 in nasal secretions following allergen challenge , and to suppress release of interferon-γ, IL-2, and IL-17 after allergen challenge in vitro models of human nasal mucosa . In vitro studies indicate that INSs can reduce IL-13 production in mitogen-stimulated cells  and reduce production of GM-CSF, TNFα, IL-6, and IL-8 generated by cultured nasal epithelial cells [85, 86]. The broad anti-inflammatory actions of INSs may prevent or reduce airway hyper-reactivity in chronic AR, and treatment with an INS has been shown to objectively reduce nasal congestion and nasal histamine hyper-reactivity in children and adolescents with perennial AR (PAR) . The pharmacological profiles of available treatments for AR show that there are a number of “pathophysiological gaps” within the AR pharmacopeia (Fig. 1). For example, at concentrations achieved following clinical dosing, LTRAs are likely to be active predominantly at the leukotriene receptor , whereas OAHs at physiological concentrations will be active predominately at the H1 receptor [62, 89]. Although AZE offers a broad mechanism of action, it does not inhibit mast cell recruitment or interfere with leukotriene receptor interactions . Likewise, INSs do not inhibit mast cell degranulation or directly interrupt leukotriene and histamine receptor interactions . As a consequence, no single medication class is capable of providing rapid and complete relief from all symptoms associated with AR (Table 1) [5, 91]. LTRAs and OAHs both act at a single site on the AR pathophysiological pathway and appear to have broadly similar efficacy . Even so-called new-generation OAHs, such as rupatadine, a dual blocker with anti-H1 antagonist properties and inhibitory effects on platelet activating factor , may not offer a sufficiently broad-spectrum mechanism of action to affect key pathophysiological drivers of AR. Studies have found efficacy advantages of rupatadine over other OAHs [94, 95], but not over INAHs . AZE, by virtue of its topical application and multimodal mechanism of action , provides superior congestion and sneezing relief over OAHs . It also provides superior ocular symptom relief to that of INSs and similar relief from nasal pruritus and sneezing to that of INSs . However, INSs, as the most potent anti-inflammatory agents, offer superior relief from congestion and rhinorrhoea over AZE . The areas in which INSs seem to fall short are their inconsistent effects on the eye  and the length of time they take to reach maximal effect. A range of ophthalmic agents are available for control of AR-associated ocular symptoms; however, their use is limited by poor tolerance for eye drops among many patients, difficulty of administration in a sterile manner, the need for frequent application, and lack of patient compliance . Thus, patients may need to use INS and OAH for ocular symptom control. Notwithstanding the time course required for efficacy, a number of reviews report that INSs, as a class, have a positive impact on ocular symptoms in AR, improving combined total eye symptom scores, as well as individual symptoms such as redness, itching, tearing, and oedema [100, 101, 102]. It is speculated that this effect is mediated through the naso-ocular reflex; however, it should be noted that not all INSs are equally consistent in managing the ocular symptoms of AR, with fluticasone outperforming mometasone in this regard [98, 103]. Furthermore, proof of the ocular efficacy of INSs comes from comparison with placebo, rather than with active therapy [104, 105, 106]. OAHs inhibit some symptoms of pruritus and erythema in laboratory models and have been shown to be superior to placebo in ocular symptom relief in clinical trials. In general, OAHs are considered superior to INSs in relief of ocular symptoms, but some studies have shown equal efficacy with these agents or even superior efficacy with INSs . However, OAHs, like INS, do not provide a sufficiently speedy ocular response. A combination of topical application and the multimodal effects of INAHs mean that these agents offer effective and rapid ocular symptom relief. 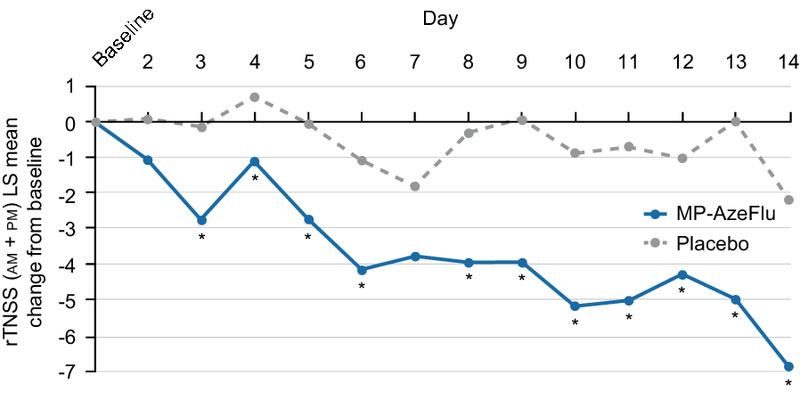 For example, more patients treated with intranasal AZE achieved substantial ocular symptom relief than those on FP, and they achieved this response many days faster . Pathophysiological gaps: what does this mean in practice? Pathophysiological gaps associated with the various AR treatment options mean that many patients remain symptomatic despite treatment [6, 17, 19, 21, 108, 109, 110]. For example, patients with moderate-severe AR in the United Kingdom have reported significant nasal and ocular symptom burden, despite the fact that most of them were actively treated (96.2%), with 70.5% on multiple therapies . Moreover, these patients reported significant AR-associated absenteeism (4.1 days/year) and presenteeism, with a negative impact on productivity of more than 50% 38 days out of the year. However, increasing the dose of the INS is not the answer, owing to its flat dose–response curve. Switching from one INS to another is also not the answer, since available INSs have comparable efficacy [27, 28]. Although adding on oral therapies (e.g. OAHs or LTRAs) might seem like a logical step, this approach offers little or no additional benefit over an INS alone in terms of control of nasal and ocular symptoms [111, 112, 113], and in the past was not recommended by ARIA due to insufficient evidence [5, 26]. The 2016 update to the ARIA guidelines does suggest (with low to moderate certainty) that combination treatment with an OAH or INAH and an INS may be appropriate for patients with SAR . Concurrent use of an INS and INAH has provided benefits over monotherapy in patients with moderate-severe SAR ; however, significant problems with this approach have been noted, including a negative impact on concordance, increased runoff both posteriorly and anteriorly , and nonhomogeneous distribution of active agents on the nasal mucosa . All of these factors highlight the need to simplify AR treatment, with a single medication option and with broader pathologic coverage than OAHs, INSs, and LTRAs, providing better and faster symptom control. MP-AzeFlu comprises an INAH (AZE), an INS (FP), and a novel formulation in a single spray. It therefore offers the benefits of broad pathophysiological coverage due to incorporation of two agents from different medication classes with different yet complementary modes of action, antagonises both early- and late-phase allergic responses, and is convenient to use. Each of MP-AzeFlu’s components (i.e. AZE, FP, and formulation) contribute to its superior clinical effect and effectiveness over currently considered first-line therapies for AR , providing significant additive effects in many instances [118, 119]. A recent study investigated the anti-inflammatory effect of MP-AzeFlu compared with AZE and FP alone in a validated in vitro model of eosinophilic inflammation . 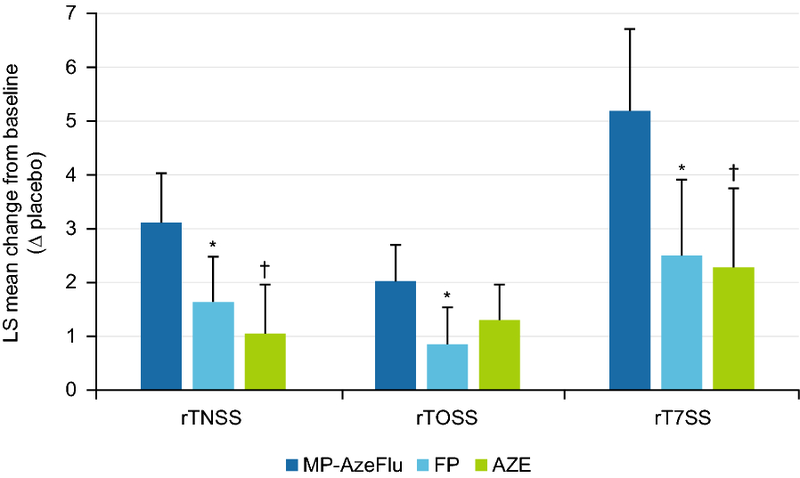 MP-AzeFlu had an inhibitory effect on IL-6 secretion, significantly stronger than that induced by FP or AZE alone, compared with control values (p < 0.05). Furthermore, the inhibitory effect of MP-AzeFlu at a 1:102 dilution on eosinophil survival at days 3 and 4 was more than twice that induced by FP or by AZE (p < 0.05). Intranasal sprays must be delivered to the nasal cavity in sufficient volume, at appropriate viscosity and droplet size, and with a technique that allows optimal retention, maximises absorption from the mucosa, and has the potential for maximum therapeutic effect. It is unlikely that concurrent use of intranasal FP and AZE would provide the same benefits as MP-AzeFlu, for two reasons. One, it is unlikely that patients would comply with a double intranasal therapy regimen in the long term, most likely choosing to use one spray only. Two, the clinical use of sequential FP and AZE requires dosing 948 μl in contrast with 274 μl for MP-AzeFlu. Application of larger volumes (more than 300–400 μl) of fluid can result in significant nasal drip (run off), as demonstrated in a human nasal cavity in vitro model . Application of MP-AzeFlu in a single spray provided more uniform distribution and greater retention in the nasal cavity than sequential sprays of AZE and FP (either branded or generic) . Both runoff and uneven active agent distribution could diminish efficacy. The effect of MP-AzeFlu on both the early- and late-phase allergic response may be observed clinically. An overview of the clinical development programme devised to study MP-AzeFlu is shown in Table 2 [118, 120, 121, 122, 123, 124, 125, 126, 127, 128, 129, 130]. Pharmacokinetic studies showed MP-AzeFlu’s formulation and device had no impact on AZE bioavailability, but did increase FP bioavailability . The bioavailability of AZE was comparable to a reformulated AZE preparation (i.e. AZE in the MP-AzeFlu formulation and device) and commercial AZE, and there was no evidence of drug–drug interactions . Although an increase in serum concentrations of FP was observed for MP-AzeFlu and for FP in the MP-AzeFlu formulation and device compared with marketed FP , it should be noted that serum FP levels were low for all investigational products and elevations were not considered clinically meaningful (elevations of a factor of eight would be needed to affect safety) . The efficacy and safety of MP-AzeFlu was assessed in four 14-day SAR studies [118, 121]. The first of these studies compared MP-AzeFlu with a commercially available INS and INAH . The other studies compared MP-AzeFlu with formulation- and device-matched AZE and FP (i.e. not commercially available), in order to eliminate the well-known effect of formulation . When this effect was removed, MP-AzeFlu still provided significantly greater overall nasal symptom relief than either FP, AZE, or placebo, with a relative difference of 30% and 39% to FP and AZE, respectively . Patients treated with MP-AzeFlu also experienced significantly superior relief from their ocular symptoms than those treated with FP alone . Also, more MP-AzeFlu-treated patients achieved a 50% reduction in their overall nasal symptom burden and complete or near-to-complete symptom relief, and they did so many days earlier than those treated with FP or AZE . The treatment difference was greater compared with commercially available FP (i.e. Flonase® generic) and AZE (i.e. Astelin®) . In this case, a relative difference of 47% to FP and 66% to AZE was noted for nasal symptoms and a relative difference of 58% and 35% to FP and AZE, respectively, was noted for ocular symptoms. When nasal and ocular symptom scores were combined, MP-AzeFlu was more than twice as effective as either FP or AZE (Fig. 2) . Over-additive effects of MP-AzeFlu were observed for those patients who had particularly bothersome nasal symptoms, most notably nasal congestion, and ocular itching. The analysis also revealed that more patients treated with MP-AzeFlu achieved a halving of their nasal symptom burden (one in every two patients) and complete or near-to-complete response, and they did so about a week faster than those treated with either FP or AZE . This time advantage of MP-AzeFlu over FP and AZE is clinically relevant since an average moderate-severe SAR symptom episode lasts 12.5 days . MP-AzeFlu was well tolerated in all four SAR randomised controlled trials [118, 121]. The contribution of formulation to the efficacy of MP-AzeFlu may be estimated by comparing the results of the study in which the effect of formulation was eliminated  with the results of the study in which it was not . A greater treatment difference was observed in the latter. These findings are summarised in Table 3 [118, 121]. MP-AzeFlu also demonstrated a significant and speedy reduction in overall nasal symptoms compared with marketed FP in an open-label study of patients with chronic rhinitis (i.e. PAR or NAR) . 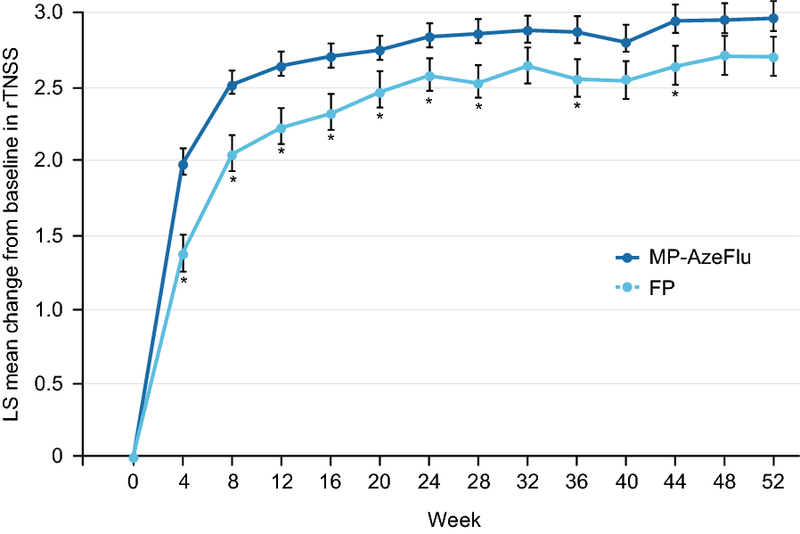 Statistical superiority over FP was noted from day 1 and maintained up to and including week 28, with treatment difference sustained for 52 weeks (Fig. 3) . Approximately seven of ten patients treated with MP-AzeFlu experienced complete symptom relief in the first month of treatment and did so a median of 9 days faster than patients treated with FP. Over the whole year patients treated with MP-AzeFlu experienced 26 more symptom-free days than FP-treated patients (8.4% more; p = 0.0005) . A similar pattern was observed for PAR . MP-AzeFlu was well tolerated in clinical trials, with no safety findings that would preclude its long-term use . The most commonly reported treatment-emergent adverse events were those usually reported for AZE (i.e. dysgeusia) and FP (epistaxis and headache) and were considered mild in severity in majority of cases [121, 125]. Dysgeusia was reported as a mild deviation in taste and occurred at approximately the same rate as in AZE monotherapy . Mucosal erosion, identified as superficial and mild in severity requiring no treatment, was reported in one trial . The efficacy and safety of MP-AzeFlu in paediatric AR has also been assessed [120, 130]. Children (aged 4–12 years) with SAR treated with MP-AzeFlu for 2 weeks experienced a statistically superior and clinically relevant improvement in their QoL compared with those who received placebo. Improvement was also observed in overall and individual nasal symptom relief, with a greater treatment effect noted as the degree of self-rating increased (Fig. 4) . A simplified symptom scoring system was utilised to assess efficacy in a second study; when all children assessed their own symptoms (rather than their caregiver, by proxy), MP-AzeFlu provided significantly greater AR symptom relief than FP . MP-AzeFlu was well tolerated in both studies [120, 130]; the most common treatment-related adverse event was dysgeusia, which was considered by investigators to be mild in severity . MP-AzeFlu has been granted approval for use in this age group by the US Food and Drug Administration . The aim of treatment is to achieve and maintain disease control, but there is a lack of consensus on what “AR control” actually is. The concept of control is well defined for other respiratory conditions such as asthma  and categorised as well controlled, partly controlled, and uncontrolled. However, in AR and rhinosinusitis the control concept is in its infancy . The importance of AR control has now been prioritised at the EU level . Attempts to define AR control are hampered by the lack of a common language to describe it. The reflective total nasal symptom score (rTNSS) and Rhinitis Quality of Life Questionnaire (RQLQ) are considered gold-standard efficacy assessments, but what do changes in these scores mean to patients, and how might we best fill the control gap that exists for people who continue to suffer the symptoms and impact of AR? Many experts believe that a simple tool to both assess and define control is needed [32, 137]. In common with other disease states, the VAS can offer a potentially relevant and simple tool to assess control and response to treatment. The VAS appears suited to this task as it correlates well with rTNSS and overall RQLQ score  and is sensitive enough to discriminate according to disease severity  and to assess the efficacy of AR treatments [140, 141]. In view of this, Contre les MAladies Chroniques pour un VIeillissement Actif (MACVIA)-ARIA (an EU reference site on active and healthy aging) proposed a new treatment algorithm (called AR CDSS)  utilising a simple VAS to determine AR control and incorporated this VAS into a free smart phone app for patients (called Allergy Diary) . Allergy Diary uses the VAS to track symptoms daily and categorise disease as well controlled, partly controlled, or uncontrolled according to predefined score cutoffs, thereby encouraging patients to take their AR medication and seek medical advice when appropriate. The AR CDSS uses a VAS score cutoff of 50 mm to assess control and guide treatment decisions . The overall aim of these tools is to facilitate better communication between all stakeholders involved, allowing doctors to more easily comply with guidelines. Such tools can be used in the controlled clinical trial setting as well as in the real world. To date, the literature reporting use of VAS scores to quantify and assess the burden of AR and the impact of treatments is relatively sparse. The studies of OAHs, INSs, and LTRAs assess their effect on symptom severity. These studies were done prior to the introduction of the MACVIA-ARIA concept of disease control  and therefore use different VAS questions and VAS anchors. However, the VAS studies of MP-AzeFlu do examine the effect on disease control as advocated by MACVIA-ARIA. Bousquet and colleagues  assessed the efficacy of desloratadine [5 mg once daily (QD)] in patients older than 12 years with intermittent AR using a VAS to score symptom severity from 0 mm (not all bothersome) to 100 mm (very bothersome). Desloratadine treatment was associated with a significant reduction in VAS score from 57.4 mm at baseline to 40.2 mm after 2 weeks, a shift of 17.2 mm. This reduction in VAS score failed to reach the clinically relevant threshold, previously defined as a VAS score change of at least 23 mm . Those in the placebo group experienced a VAS score reduction of 10.9 mm over the same time period . 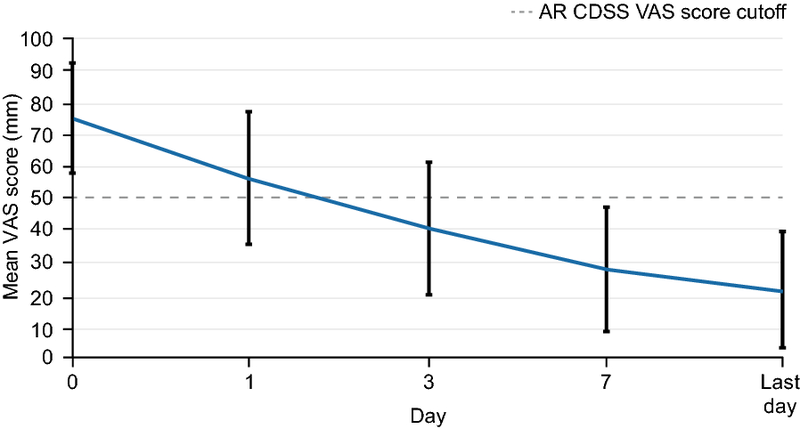 A follow-up article on those with persistent AR reported that patients treated with desloratadine for 12 weeks experienced a 32.5 mm reduction in VAS score (approximated from graph), compared with a 29 mm reduction experienced by the placebo group . However, significance versus placebo was lost by week 10, and unfortunately, only change from baseline in VAS scores was provided rather than actual scores. Ratner et al. compared the effectiveness of a 15-day course of intranasal FP (200 μg QD) with oral montelukast (10 mg QD) in 705 patients with SAR, using four separate VASs for each of the four most common AR nasal symptoms (i.e. congestion, rhinorrhoea, sneezing, and itching). These VASs were anchored from 0 (no symptoms) to 100 (maximum symptom severity). FP treatment provided significantly better nasal symptom relief, associated with an approximately 30 mm VAS score reduction for each of the four nasal symptoms (averaged over weeks 1–2) compared with an approximately 20 mm VAS score reduction for montelukast (p < 0.001 for each symptom) . However, again the authors reported change from baseline in VAS scores, rather than actual scores. Furthermore, calculation of the total symptom score was done by adding each of the individual symptom VAS scores together (rather than having a separate VAS for total symptom score), making it difficult to compare these results with those of other VAS studies. Other studies have used a VAS to compare the effectiveness of INS, but for their effects on hyposmia and nasal discharge in PAR patients, rather than on symptom severity . Yamamoto et al. assessed whether add-on loratadine might be effective for SAR patients showing unsatisfactory control of symptoms with montelukast during a pollen season. They used a VAS to assess unsatisfactory control (i.e. VAS score > 50 mm) and measure symptom severity reduction for total symptoms and each of the four usual AR individual nasal symptoms from 0 (no symptoms) to 100 (highest severity symptoms). There was some evidence to show that adding loratadine to montelukast was beneficial in alleviating the symptoms of sneezing and rhinorrhoea versus montelukast alone. Patients showed a mean rhinorrhoea baseline VAS score in both groups of approximately 43 mm (at pollen season peak), which reduced to 25.3 mm in the combination group compared with 41.1 mm in the montelukast-only group (p < 0.005; midpollen season), and ended at approximately 20 mm for both groups by season’s end . A similar pattern was observed for sneezing VAS scores over the same period. Unfortunately, as with other studies, the exact wording of the question posed to patients prior to completing each VAS was not published. Additionally, the method by which total symptom VAS scores were calculated was not provided. The efficacy of MP-AzeFlu in real life has been assessed in a pan-European noninterventional study conducted in Germany, Scandinavia (Sweden, Norway, and Denmark), the United Kingdom, and Romania [123, 124, 126, 127], using a VAS in line with EU and MACVIA-ARIA initiatives. In these studies, the VAS question was clearly stated: “please reflect on how bothersome your symptoms were within the previous 24 h”, and text anchors provided from 0 (not at all bothersome) to 100 (extremely bothersome). Data collected during the German arm of the study highlighted the suboptimal symptom relief provided by frequently prescribed AR medications, including antihistamines, INSs, and multiple therapies . Patients had an average baseline VAS score of 75.4 mm, despite the fact that almost all of them were receiving AR treatment, and almost two-thirds of that group were receiving multiple-therapy regimens . Uncontrolled disease was also apparent from high physician consultation rates, with patients averaging 2.6 AR visits in the current calendar year. MP-AzeFlu reduced VAS scores from 75.4 mm at baseline to 21.3 mm by the last visit, a clinically relevant shift of 54.1 mm (Fig. 5) . Patients treated with MP-AzeFlu achieved the AR CDSS control VAS score cutoff of 50 mm within 3 days. One of every two patients felt his or her symptoms were well controlled at day 3. Effectiveness was confirmed irrespective of phenotype (SAR, PAR, or both), age (12–17 years, 18–65 years, and > 65 years), and symptom severity at baseline . The efficacy results from Germany were later confirmed in patients from other countries in this pan-European study. Treatment with MP-AzeFlu significantly reduced the mean VAS score from 73.7 mm at baseline to 23.4 mm by the last visit and the results were consistent across countries, age, phenotype, and degrees of disease severity . MP-AzeFlu was well tolerated in real-life studies, with dysgeusia as the most frequently reported adverse drug reaction . Nausea, sneezing, nasal discomfort rhinorrhea, application site pain, and epistaxis were also reported by some patients; none of the adverse events or adverse drug reactions were considered serious . For patients with AR whose symptoms remain uncontrolled by pharmacotherapies, use of allergen immunotherapy may be an important treatment option . Allergen-specific immunotherapies involve administering allergen extract, either subcutaneously or sublingually, to desensitize patients against specific allergens and reduce symptoms and medication requirements . Both subcutaneous immunotherapy (SCIT) and sublingual immunotherapy (SLIT) have been shown to be effective in patients with SAR and perennial AR, and are well tolerated with localised side effects, such as pain, itching, and swelling . Because subcutaneous administration of allergens can occasionally cause severe allergic reactions requiring access to adrenaline and other resuscitative measures, SCIT should be administered in a specialist clinic, whereas SLIT can be self-administered [146, 147]. Indirect comparisons indicate that both SLIT and SCIT may be as potent as pharmacotherapy in controlling symptoms of AR [148, 149]. MP-AzeFlu is currently the only combination therapy available for the treatment of AR. MP-AzeFlu blocks two important pathophysiological pathways involved in the early- and late-phase reactions in the disease, providing rapid relief from all symptoms associated with AR. However, all patients are not the same, and the inflammatory pattern may vary considerably depending on what drives the disease in each individual. The new AR CDSS algorithm and use of the VAS can support management of AR in both primary and secondary care. In addition, the effectiveness of combination treatment compared with corticosteroids alone should be evaluated in broader, real-life populations, including patients with both AR and NAR, as well as those with concomitant rhinosinusitis. Further mechanism of action studies will also pinpoint more exactly the pathophysiological gaps that are plugged with MP-AzeFlu therapy. Another question for future research is whether it might be beneficial to block additional pathophysiological pathways that are not covered by antihistamine or corticosteroid treatment. CysLTs such as LTC4 and LTD4 are proinflammatory mediators and potent bronchoconstrictors that induce nasal congestion. Combining an anti-leukotriene with an antihistamine has proven to be effective in some patients with AR [150, 151], especially those with concomitant asthma and rhinitis. To understand the best principles of disease control, it is necessary to explore important biomarkers and evaluation parameters that relate to optimal disease control in both the short and long term. This calls for better clinical evaluation instruments that take into account the complexity of a disease with many different faces. LB, MW, MH, and MCW contributed to the design and implementation of the review methodology, the analysis of the results, and to the writing of the manuscript. LB Supervised development of the work. All authors provided extensive evaluations of the manuscript. All authors read and approved the final manuscript. Medical writing and editorial support in preparation of this manuscript was funded by Mylan Inc. and provided by Lisa Baker, Stephanie Eide, and Paula Stuckart of Ashfield Healthcare Communications. LB has received honoraria to participate in or give lectures for ALK, AstraZeneca, Boehringer Ingelheim, Chiesi, GlaxoSmithKline, Novartis, and Teva. MW, MH, and MCW declare that they have no competing interests. This manuscript and medical writing support in development of this manuscript were funded by Mylan Inc. (Canonsburg, PA, USA). Dymista summary of product characteristics for Norway. https://www.medicines.org.uk/emc/medicine/27579. 2014. Accessed 12 Oct 2018. Dymista approved in children 6 to 11 years of age with seasonal allergic rhinitis. http://cisn.co/2AD11JK. Accessed 12 Oct 2018.